This region includes Maryland, North Carolina, Virginia, Washington, DC, and West Virginia. The Haiku Poets of Central Maryland sponsors the Anita Sadler Weiss Haiku Competition and publishes annual poem-sheet collections of haiku, senryu, and tanka. HPCM is also the home of Black Cat Press. The Towpath haiku group works through organizations in and around Washington, DC, to deepen the understanding and enjoyment of the haiku arts. Towpath has partnered with the Women’s National Book Association and the Japan-America Society of Washington to present programs in haiku education, and has designed and staffed the “Haiku Table” at JASW’s annual Japan Bowl competition for high school students. The North Carolina Haiku Society hosts Haiku Holiday, an annual festival drawing poets from around the state for a full day of presentations, workshops, and haiku walks. The event takes place in late April in a beautiful rural setting in the Raleigh–Chapel Hill area. Virginia, too, has riches to offer. It is home to the journal South by Southeast: Haiku & Haiku Arts, to Red Moon Press, and to The Haiku Foundation, a national and international organization devoted to preserving and promoting the art of haiku. 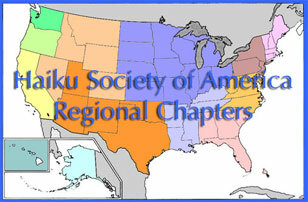 To learn more about haiku events in this region, please get in touch with the Mid-Atlantic regional coordinator. Wherever you may be in the area, you will find a group of haiku poets waiting to welcome you. Bob Ertman lives in Annapolis, Maryland, and writes haiku and other short poems as a Zen practice, living fully in the present moment and not looking away.